The first book in the Baudelaire siblings’ miserable saga of woe and misfortune. From the bad beginning to the bitter end, there’s nothing but darkness in store! One day, Violet, Klaus and Sunny receive terrible news. Their house has burned to the ground. 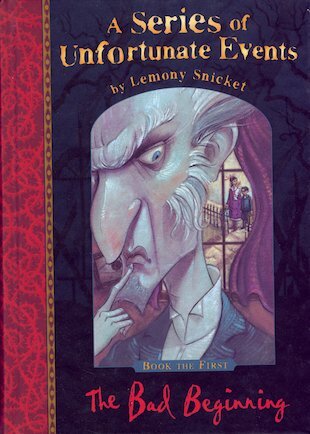 Their parents are dead – and they are being sent to live with their rotten relative Count Olaf. He treats them like slaves, but that’s not all. He will stop at nothing, not even murder, to get his hands on the family fortune. Will they ever escape the ogre Olaf and his hideous henchmen? 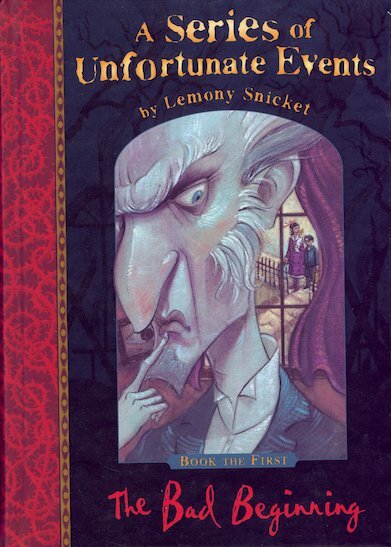 Comical, wry, gothic and clever, Lemony Snicket’s blackly funny tales are true cult classics. Forget happy endings! AMAZING! read this book if you haven’t if you have READ IT AGAIN!!!!!! I tried to read this book a couple of years ago and i couldnt get into it. It’s a little strange how even though these books each have their unfortunate event they are really enjoyable, each page spent in anticipation of Violets inventions, Klaus’ knowledge and sunny’s Bites. this is the first in the series where we first meet and fall in love with the orphan, still unsuspecting of all the misfortune yet to come.